After splitting a two game series with the Athletics, the Dodgers (63-52) travel to Colorado for a four game series against the Rockies (60-54). The Dodgers currently trail the Diamondbacks by half a game, so they’ll be looking to maintain their position in the NL West while playing in Coors Field. They’ll send Ross Stripling, who last pitched on July 29 giving up four runs in four innings against the Braves. That made two rather ineffective starts in a row, most likely (definitely not) due to his “toe inflammation” which put him on the DL in the first place. The Rockies will send Tyler Anderson, who has been quite good this year for a surprisingly strong Colorado starting staff. Anderson is left-handed but has actually performed better against right-handed batters this season (4.32 FIP/.293 wOBA allowed) than he has against LHB (5.24 FIP/.367 wOBA allowed). Over the entirety of his career, Anderson features almost no platoon split with a 4.06 FIP and .317 wOBA allowed vs. LHB compared to a 4.29 FIP and .323 wOBA allowed vs. RHB, which essentially means play your best batters. That looks to be the simple explanation for the lineup today, with the only sensible changes being inserting a struggling Max Muncy at first, and moving Cody Bellinger to center, and it’s totally understandable why Dave Roberts decided against that. 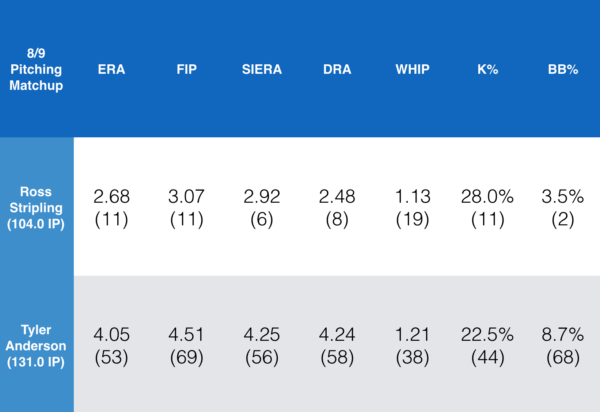 Normally I’d mention how the underlying stats indicate that Anderson and the rest of the Rockies rotation are better than you’d think, but luckily — old friend Mike Petriello kindly released an MLB.com article today on that very subject. There’s more on Anderson and the Rockies in there than I can fit into a thread so, enjoy. Stripling on the other hand has been fantastic this year, but his first two starts since the All-Star Break totaled 8.2 innings, in which he allowed 14 hits, four homers, and nine earned runs (9.35 ERA/6.96 FIP). If you’re looking for a positive takeaway from those starts, Stripling still struck out 11 (26.8% K-rate), and his evolution into a strikeout pitcher was the basis of his breakout. The most innings he’s thrown in a season is 127.2 across A+ and AA in 2013, so as he’s pushing closer and closer into uncharted territory it’ll be important to monitor his fatigue and effectiveness. Hopefully he can return strong from his time off against a meager Rockies offense, but…Coors Field is Coors Field. 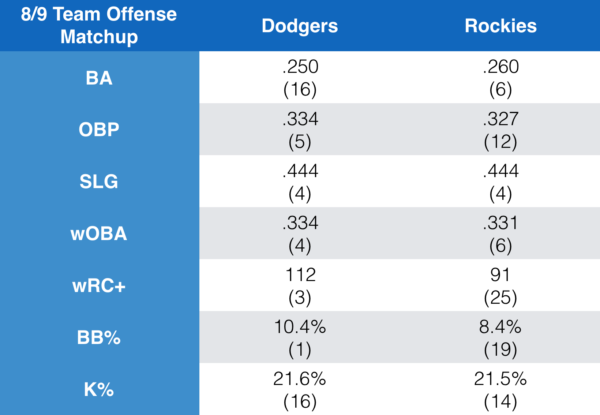 By the majority of stats, the Rockies offense looks strong and comparable to that of the Dodgers. 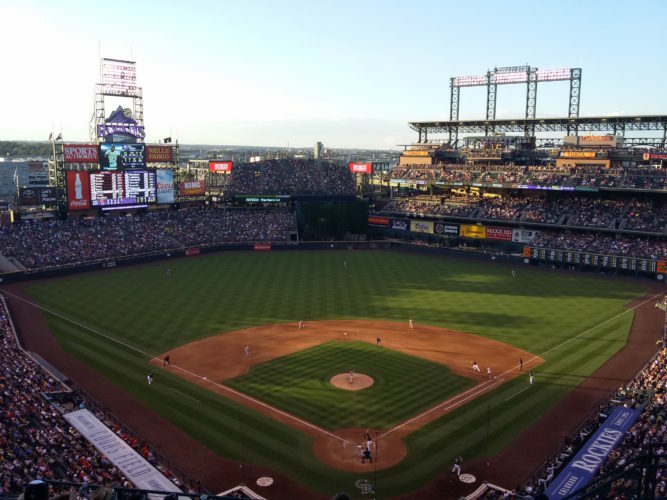 However, when accounting for the fact that they play half of their games at Coors Field, it’s evident that oddly enough — their strong suit is starting pitching and their weakness is offense. Their offense is headlined by MVP hopeful, Nolan Arenado who has a real shot to win the award after three straight years finishing inside the top-10. Arenado is in the midst of his best offensive season yet, posting highs in walk rate (11.9%), OBP (.388), SLG (.584), OPS (.972), and wRC+ (142). Besides him, Trevor Story is having a great season as well posting a wRC+ of 123, with 24 homers and 14 steals. Carlos Gonzalez is having a productive year with a 105 wRC+ compared to an 84 last year, while Charlie Blackmon has regressed hard — featuring a 109 wRC+ after a 141 last year, and 131 the year prior. In other news, Stripling is able to pitch today because Pat Venditte is going back down to OKC. The #Dodgers reinstated right-handed pitcher Ross Stripling from the 10-day disabled list and optioned switch-handed pitcher Pat Venditte to Triple-A Oklahoma City. Meanwhile, Julio Urias looks to be building up to his eventual return, pitching this Friday in Rancho Cucamonga for the Quakes. 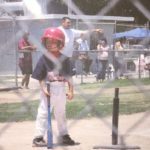 If you’re a subscriber with The Athletic, Dustin May is good and this piece covers him so check it out. Four pitchers under the age of 21 are​ making​ talent​ evaluators​​ around the game take notice. And one of them is Dodgers prospect Dustin May. The MLB Players’ Weekend names are out, and nothing compares to the legend Rich Hill going with “D. Mountain”. That will never be topped. First pitch is at 5:40 PT on SNLA.